SING A JOYFUL SONG. BOOGIE ON DOWN. CHEER REAL LOUD--SANTA'S COMING TO TOWN! "Follow me in merry measure...." say the creators of this jolly board book for tots, who get tots moving and grooving in the spirit of the festive season. 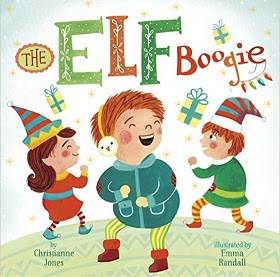 The youngest wannabe elves among Santa's helpers need to giggle and wiggle to work off the excitement of the days just before Christmas, and these youngsters in their bright, peaked caps shake and shimmy, move and groove, tap and clap, and boogie their woogies in Christianne Jones' The Elf Boogie (Holiday Jingles) (Picture Window/Capstone Books, 2015). Emma Randall's fluid illustrations add to the fun in a board book that encourages kids (and parents) to get up and dance or sing and swing, so that everyone can get in the spirit of making the season merry and bright. Other books in the series are The Reindeer Dance (Holiday Jingles), and The Santa Shimmy (Holiday Jingles) all great stocking stuffers for jiggly, jingly tots.